Blu-ray to AVI Ripper is an excellent Blu-ray to AVI ripping software tool. 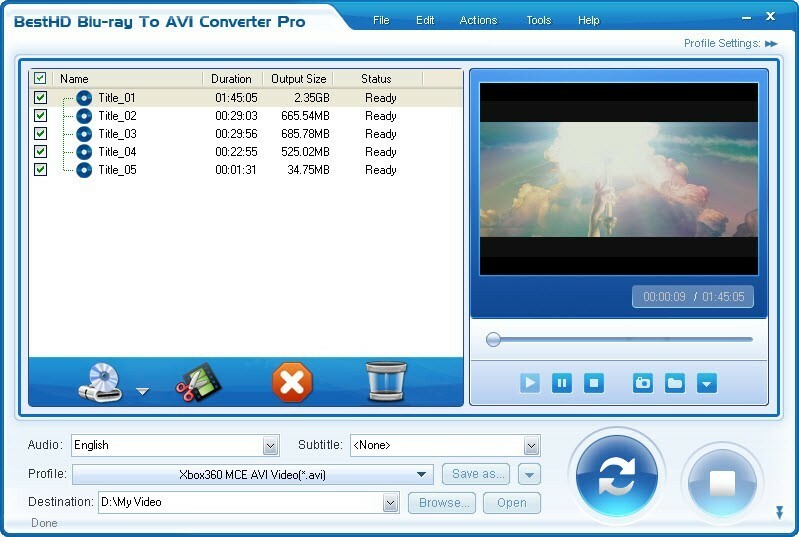 It can help you to convert Blu-ray movie to AVI video and rip Blu-ray DVD to AVI file. With Blu-ray to AVI Ripper you can get a variety of AVI formats such as DivX AVI, Xvid AVI, MJPEG AVI, and H.264 AVI videos. And sorts of Blu-ray disc (BD), DVD-5, DVD-9, and IFO image files are perfectly supported by Blu-ray to AVI Ripper. Blu-ray to AVI Ripper can help you to convert Blu-ray movie to AVI video and rip Blu-ray DVD to AVI file with excellent video quality and super fast speed. It supports a variety of AVI formats such as DivX AVI, Xvid AVI, MJPEG AVI, and H.264 AVI videos. Sorts of Blu-ray disc (BD), DVD-5, DVD-9, and IFO image files are perfectly supported by Blu-ray to AVI Ripper. Blu-ray to AVI Ripper allows you to adjust AVI video encoding settings to customize the output quality. You can also clip any segment from the original Blu-ray movie.